I often find myself at the end of the day looking at what I’ve eaten and there’s usually a few things I need – more protein, and more greens. For that reason, I’ve developed a lot of ways to quickly whip something up that has greens & beans. I’ll make some kind of lentil or bean dish and pour it over spinach, mix kale with baked sweet potatoes & roasted chickpeas, or I’ll throw together a little spinach salad like this one! Most nutritionists and government ‘dietary guidelines’ suggest consuming 9 servings of fruits & veggies per day! This equates to roughly 3 full cups of fresh vegetables each day. If you’re cooking them, its 1.5 (they cook down). Most Americans don’t get nearly enough fruits & vegetables in their diets – it is vitally important to eat these nutrient dense foods to keep our bodies in tip top shape. These don’t HAVE to be leafy greens, but let me tell you why at least some of that should be be leafy greens. If you want to read more about the benefits of consuming leafy greens, check out this article, 10 Incredible Effects on Your Body When You Eat Dark, Leafy Greens. 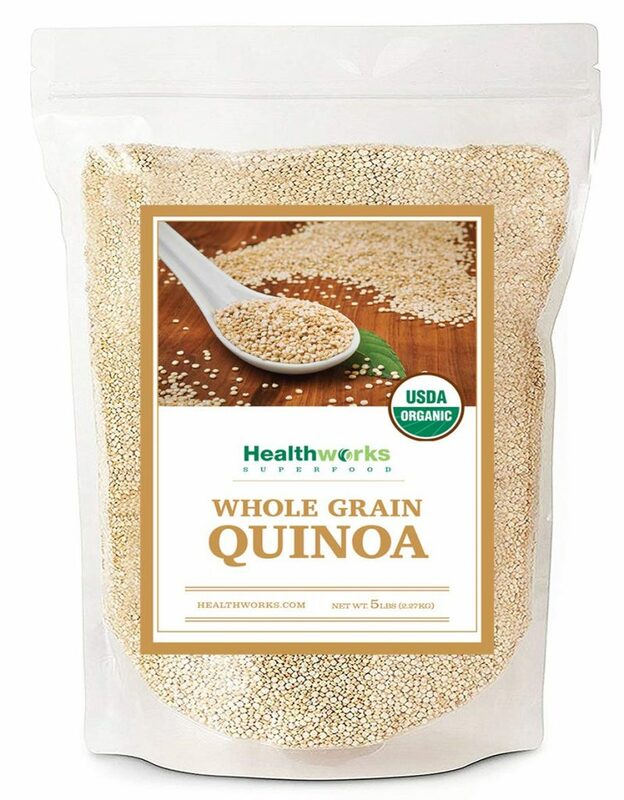 (CLICK TO GO TO AMAZON) If you don’t have a place to buy bulk quinoa near you, I highly recommend purchasing this one from Amazon – its Organic & a great price! 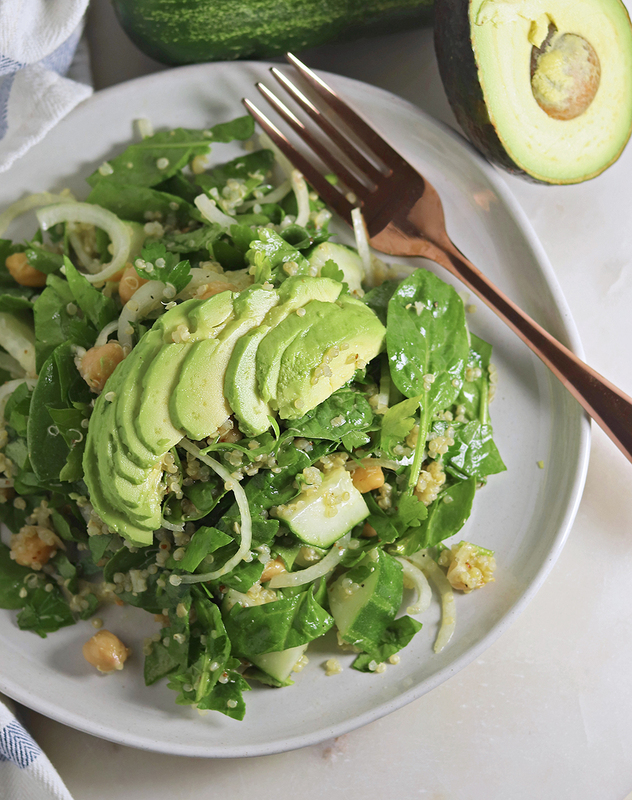 A quick Plant Based salad full of protein, greens, and healthy fats. This salad comes together in less than 20 minutes and makes several servings. Will keep in the fridge for about 2 days. Start your quinoa so you can prep while it cooks. In a small pot, add 1 cup of water and 1/2 cup Quinoa and bring to a boil. Cover, reduce heat to medium low and simmer until water is absorbed, 15 to 20 minutes. Set aside off the heat for 5 minutes; uncover and fluff with a fork. Alternatively, you can cook in an Instant Pot or use a rice cooker. Whisk together the oil, ACV, minced garlic, mustard, and maple syrup. Add salt & pepper to taste. Wash your spinach & parsley by soaking in a bowl of warm water with 1tbls salt added. Rinse well after soaking for 10 minutes. While the greens soak, chop your cucumber and thinly slice your onion. Then, rinse your chickpeas. Add them all to a large bowl. After rinsing your greens, chop them roughly and add them to the bowl with the chickpeas, onion, and cucumber. 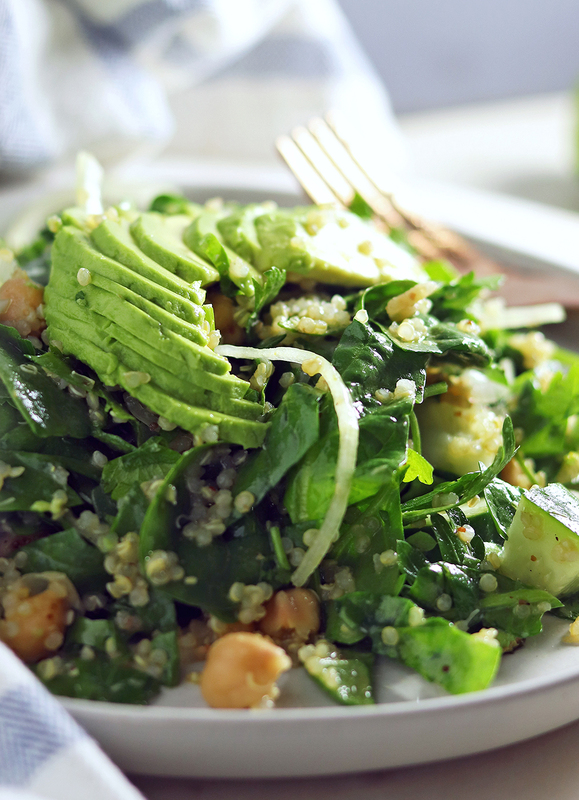 Once the Quinoa is finished cooking, add it to your salad (its okay if the quinoa is still warm). Pour over your dressing, and toss. If you plan to use this for meal prep, only add dressing to the portion of the salad you plan to eat - then store it separately. I personally dressed the entire thing and ate it within 2 days and it was perfectly fine. It would probably be good for about 3 or 4 days without the dressing. For more flavor, you can cook the quinoa in vegetable broth, but it will add more sodium.